Editorial Board of Miscellanea Zoologica journal (past member). Emil Kucera, the firm’s Principal and chief translator, has translated and interpreted for more than 40 years, serving clients that include Canadian and US federal governments, provincial governments, corporations, universities and private citizens. Clients from 11 different countries, at the last count. Source documents that he translated range from certificates to refereed journal articles, and include two full-length (science and medicine) hardcover books, both published by Johns Hopkins University Press. Other assignments, some of them for other translation providers, include back-translations (with reviews and corrections of the forward translation), translations for film subtitles and timing to video, and editing of translated works. Main focus of his work is on zoology, medicine, pharmaceuticals, and other life sciences. in 4 language combinations, mostly medical/pharmaceutical subjects. During his career, Dr. Kucera held various professional positions and authored more than 40 original publications—peer-reviewed scientific journal papers, a book chapter, and departmental technical reports as well as extension materials. In 2000, he retired from the post of Senior Scientist with Manitoba Department of Environment (now Conservation). During his 24-year career with the province, for which he received Manitoba Premier’s Meritorious Service Award, his various assignments involved research, management, editing, and consulting. He also represented the department on various task forces and technical advisory committees and presented research results in various fora, both in Canada and internationally. 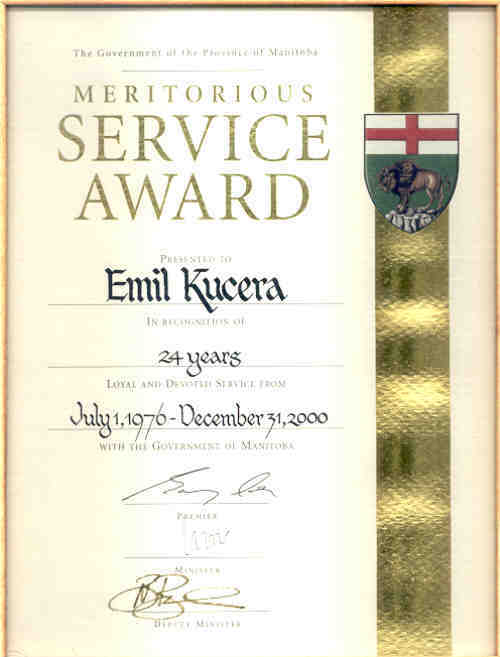 Dr. Kucera’s job accomplishments include the first fully electronically produced and type-set departmental report and establishment of one of the first departmental web sites of Manitoba government. He directed preparation and publication of the first two State of the Environment reports, 1991 and 1993, for the province and wrote sections of both reports. After his retirement from the civil service, Emil joined Pluri Vox Media Corp as director, editor and webmaster of an ethnic media monitoring project for the federal government. During that assignment he edited more than 9000 summaries—more than one million words—of stories prepared from ethnic newspapers by translators across Canada, meeting every one of the 164 weekly deadlines over the 4-year project. Since the conclusion of the monitoring contract, Dr. Kucera focuses on his various current translating, editing and consulting projects. Largest of those was editing (together with Martin Gerrard Associates) of a four-volume technical report on on animal health effects associated with exposure to emissions from oil and natural gas field facilities (for Western Interprovincial Scientific Studies Association), completed in 2006. The Roots of Evil, was published in 2009. A full detailed resume with references is available to bona fide clients—please e-mail for a password to access.